Use the form below to inquire about Upscale Beach Resort at Calangute . Use the form below to reserve for Upscale Beach Resort at Calangute . Air Conditioned Room, Hot and Cold Running Water, In-room Refrigerator, Intercom, Private Balcony/Verandah, Safe, TV with cable connection in each rooms. These rooms have a pool or garden view from their attached balcony or garden terrace. Air Conditioned Room, Hot and Cold Running Water, In-room Refrigerator, Private Balcony/Verandah, Safe, TV with cable connection in each rooms. The rooms on the ground floor have garden terraces, the upper floor rooms have attached balconies. Make the Upscale Beach Resort at Calangute your home to enjoy the best of the Goan sun, sand, and sea. Goa turns a dull day into a party with its positive vibes and, of course, its beaches. You can never have enough of this little coastal state and will find enough reasons to keep coming back again. Although it is culturally divided into two parts, the touristy North Goa and the historically rich South Goa, the entire length and breadth of the state offers what you’re looking for — a relaxed and laid back holiday. The Upscale Beach Resort at Calangute is the perfect place to unwind during your holiday in Goa. It is located right on the Calangute Beach, yet away from the maddening crowds. The private beach experience that the resort offers will appeal to the sea lovers while the lush garden leading up to the beach is enough to seal the deal for a nature lover. 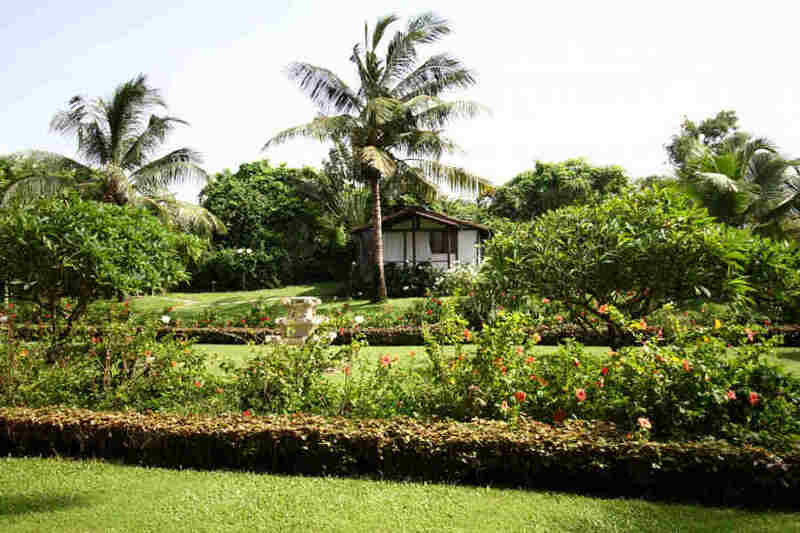 The anytime access to the beach and the sea makes this resort popular among vacationers in Goa. The foundation of this family-owned resort dates back to 1986. Since then, the Upscale Beach Resort at Calangute has been pampering its guests with the little luxuries. The property features exclusive sunbeds reserved only for those staying at the resort. You might not want to vacate one, thanks to the 24/7 sea views. The resort also features artifacts, such as statues of Buddha and also laughing Buddha. The in-house multi-cuisine restaurant at the resort offers scrumptious a la carte menu and special homemade desserts. What else would you need to add zest to your beach holidays? There are more than 100 rooms divided into three types of accommodation at the Upscale Beach Resort at Calangute —Standard AC rooms, Standard large AC rooms, and Superior AC rooms. While most of these rooms offer breath-taking views of the garden, sea-facing, and pool-facing rooms are also available. Each of these rooms is equipped with all the essential amenities you might need during your stay, including a fridge and a TV. Besides these room categories, the property also has Garden Cottages and Beach Garden Cottages. From well-appointed rooms and lip-smacking cuisines to fabulous views and first-rate amenities, the property has everything to spoil you silly during your holiday. Extra occupancy charges apply for extra children above 6 years and extra adults. The check-in time is 1 PM and check-out time is 11 AM. Early check-in and check-out are subject to availability. Smoking allowed only in balconies. Friends of guests, outside food, and pets are not allowed. A non-refundable advance (one night’s charges) is required for booking. None of the rooms are sea facing but the property is touching the beach and has direct access to it. Any cancellation before the arrival date will incur a cancellation fee equivalent to one night's tariff. Goa is a melting pot of cultures and a paradise for nature lovers and those who want to have some fun. Being located close to the most popular beaches in Goa, the Upscale Beach Resort at Calangute is a happening place to be at. Other than the private access to the Calangute Beach, you can visit some of the other popular beaches in North Goa, including Vagator Beach, Ashwem Beach, Anjuna Beach, and Arambol Beach. You can also check out the popular Mapusa market, Saturday night market, and Wednesday flea market. The sea opens up an ocean of opportunities for adventure lovers and thrill-seekers. You can indulge in the many water sports that Goa is popular for, including banana boat rides, jet ski, and parasailing. There are also places where you can try your hand at gokarting and paintball. If you would rather spend your time lazing in and around the periphery of the resort, head straight to the swimming pool to beat the heat or take a nap on one of the many sunbeds facing the vast sea. You’ll have the sound of the crashing waves for company. Mapusa (11 km), Panjim (16 km), Vasco Da Gama (38 km), Ponda (43 km), Margao (48 km), Mangalore (391 km) via NH 66, Hampi (361 km) via NH 67 and NH 748, and Mumbai (566 km) via NH 66.